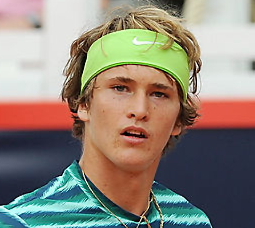 Alexander Zverev (CR 157) is a 17 year old German player. He is also known as Sascha Zverev. He is 6’6’’ and is listed at 189lbs. He plays right-handed and is coached by his father. I watched him playing last month and was captivated by his youthful enthusiasm. Although he got routed in the semi-finals by David Ferrer, it was fascinating to watch him throw everything he had into his matches. Ultimately, I think his body broke down under the demands of playing so many games at a level not previously experienced. I will continue following him because I am definitely intrigued by his fiery personality and game. I am curious about his maximal potential as he matures and hones his skills. On 7.15.2014, Alexander won his 1st ATP World Tour match when he defeated (51) Robin Haase. It was relatively one-sided; Haase looked completely befuddled and lost easily 0-6, 2-6. Alexander followed that win by beating (19) Mikhail Youzhny, 7-5, 7-5 in the next round; then he beat (32) Santiago Giraldo, 6-4, 7-6(6) in the following round; and then (83) Tobias Kamke, 0-6, 7-5, 6-3 in the quarter-finals before finally succumbing to (7) David Ferrer, 0-6, 1-6 in the semi-finals. He is the youngest player ever to reach the semi-finals at an ATP World Tour 500-level event.